There is one hypothesis that I find interesting because it is so minimal, yet sufficient. This is that nobody cares where he sits, as long as it’s not in the very front. Where do you like to sit in a movie theatre? If you’re like most people, you sit fairly far back, maybe all the way in the back row. Sitting in the rear is the default for public gatherings, it seems. Thomas Schelling famously offered seven hypotheses about why people don’t fill up the front of an auditorium as fast as they fill up the back. His reflections were occasioned by his giving a lecture to 800 people, none of whom would sit in the first dozen rows. I know the feeling, though on a smaller scale. Seeing all your audience huddled so far away, you suspect you have cooties. Schelling didn’t, so far as I can tell, offer a definitive answer, and his charitable reflections on people’s motives don’t keep me from finding the migration to the rear disquieting. In lectures, those distant auditors send off an air of foreboding. They seem poised to flee at the moment the talk reveals its fully catastrophic dimensions. There’s a debate about whether students who sit in the rear get worse grades than those who sit close. (See below.) Speaking from experience, I’d be inclined to say that professors tend to give better grades to students sitting close because those distant, blurred ranks tend to give off an aura of desperate yearning to be anywhere but there. The folks up front at least seem to be trying to be part of things. The back-row brigade have not learned the great lesson of social life: Feign interest. As this lead-in suggests, I’m a front-zone sitter. But that predilection comes at a cost. For lectures I always try to get a front-row seat, close to the speaker if possible, or centered if there’s to be a big visual presentation. This vantage point is great. If there’s flop sweat, you see it. If not, you get to enjoy consummate performance up close. I’ve sat in the front row for fine speakers like Chomsky, Pinker, and Bruner (to stay just with the Boston brain trust). When a filmmaker does a Q & A, the front row is a must: you get a good chance at an autograph. The only time I regretted my prime front seat for a live event was for a concert—a John Zorn one. Within five minutes I expected my eardrums to bleed. After that overture I don’t think I heard anything else. I saw back-row bias in the movies demonstrated dramatically in Madrid, where Tom Gunning and I went to a movie together. I forget the name of the theatre, but the film was Welcome to Veraz (1991), a Euroduction featuring, inevitably, Richard Bohringer and, less predictably, Kirk Douglas. Once we got inside, we found that our tickets were for specific seats. The cashier had assigned us, and all other patrons, to the same row—in the back, naturally. The absurdity of a dozen of us sitting side by side in a vast theatre was lost on the staff. Tom and I moved to the front, but everybody else piously stayed in the same pew. You can study a less extreme case in graphic form in those remaining venues, mostly European and Asian, that still ask you to choose your seat on a chart. A glance shows you that everyone has piled into retreat mode, leaving lots of nice seats for you. Problem is, those overhead diagrams of the venue aren’t to scale, and so you don’t really know how close you are to the screen when you’re picking your seat. When you were little, you didn’t mind sitting up by the screen. You sometimes fought to do it. But as we age, we seem to gravitate toward the rear. We’re even told that we should sit a prescribed distance back, usually the dead center of the auditorium. A distance of 2-3 times the screen height is a common recommendation. But Kristin and I are front-zone people. Speaking for myself, I like scanning the frame in great saccadic sweeps and even sometimes turning my head to follow the action. CinemaScope and Cinerama give your eyeballs a real workout. I know that most people find this sheer madness. When the picture comes looming up, you do feel a little disconcerted and overwhelmed. But I find that I adapt in a minute or two. Even the keystoned angle isn’t a problem, partly because of our old friend perceptual constancy. Note that I said front-zone. Not every theatre favors front-row sitting. Kristin and I once went to a screening of An Autumn Afternoon in a tiny Parisian house, one of those that seem to have been carved out of a loading dock. We sat in the front row, but that was a mistake. We could put our feet up against the wall housing the screen, and we reckon we watched the movie at something like a 45-degree angle. Something a little more peculiar happened when we went to a Fan Preview of Scott Pilgrim vs. the World. Firmly ensconced front and center, we were packed in by comic geeks, nerds, dorks, wonks and other damned souls, all determined to enjoy this movie. So we had the strange experience of hearing a line of dialogue and then, because its eloquence had a rich bouquet, hearing yelps of appreciation rolling back behind us, as row after row (a) heard it, (b) laughed, and (c) did an instant commentary on it. I can’t judge this movie objectively to this day. 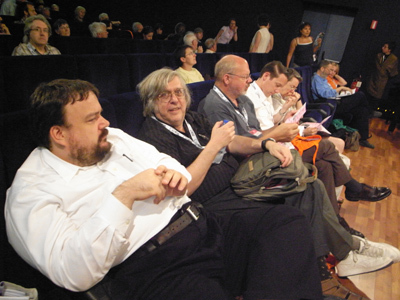 Bologna Cinema Ritrovato 2008: Olaf Möller, Jonathan Rosenbaum, Don Crafton, Haden Guest, Kristin Thompson. But in many venues the front row is perfect. Sitting there is hard-core moviegoing. I started aiming for it about forty years ago, when I began taking notes on every film I saw. If you sit too far back, how can you see your pad? You can’t be one of those idiots brandishing a lightbulb pen (even though I have some of those). The screen casts a little light that makes scribbling easier. But even those who don’t write notes see the advantage of the front row. Nobody’s head looms in front of you. You’re less disturbed by latecomers. You have more leg room, and it’s easier to stretch out for a snooze. And should you wish to leave, the front row is the only one that lets you sneak out easily from any seat. That last advantage, I should mention, can lead to trouble. 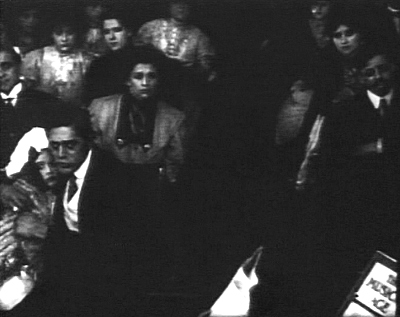 Once at VIFF I was firmly planted in the front row, nose in book, as the auditorium filled. But I began to realize that these didn’t seem to be my tribe. There were more beards, nicer clothes, better hygiene, more sensitive faces. The place filled, and someone came forward to thank the sponsors for bringing a film about the efforts to save remote wetlands. I was in the wrong auditorium. To glares and mocking comments I slunk out in search of some obscure art movie I’ve forgotten. Like everything else you do, front-row sitting sends a message. What message? For one thing, that signal of interest I mentioned in my classroom example. 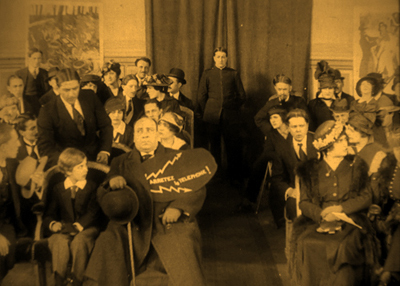 Somehow the front-row sitter seems to be more engaged, more eager to be swept up in the magic. You probably know the urban legend that the Cahiers du cinéma writers sat devoutly in the front row at Langlois’ Cinémathèque. We belong to a noble tradition, and we flaunt it. Chevaliers of cinéphilie, we risk eyestrain, neckache, back pain, and leg cramps for the art of cinema, or so we like to think. Speaking of the Cinémathèque, back in 1970 I went to the Chaillot venue for a screening of Liebelei, to be attended by Luise Ullrich, one of the principal players. The place was full, but I had nabbed a nice spot up front. Before the film started, though, a Cinémathèque functionary started going along the front row asking every patron there a question. Everyone asked said no. I couldn’t hear the question at a distance, and perhaps might not have understood it if I had. So when the staff member came to me, I scarcely let him finish before declining. If non was good enough for other front-row denizens, it was good enough for me. After the lights came down, Henri Langlois stepped onstage with Mme Ulrich. After a brief introduction, they descended. Only then did two people on the aisle surrender their seats for them. Then I realized all the French guys sharing the front row with me wouldn’t give up their seats even for the guest and the boss of it all. You see why I say front-row people are hard-core? Le Pied qui étreint 1: Le Micro bafouilleur sans fil (1916). I must report, however, that front-row sitting sends other signals too. Theatres in film archives have their regulars, and these folks, like me, believe that there’s only one good seat in any theatre, and they must occupy it. Fortunately, they mostly don’t agree on what that seat is. I’m always befuddled when the first person in the queue makes a dive for a seat far back and in the corner. 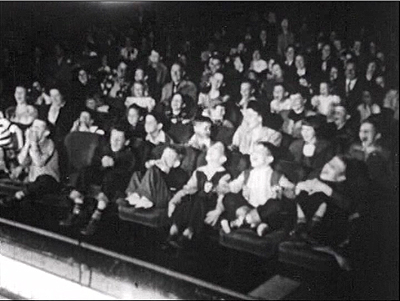 Alas, though, so many regulars have aimed at my target that every cinematheque has a coterie of front-row fans. And they’re perceived as, well, strange. I remember going to London’s National Film Theatre during a visit and getting in early enough to nab a prime front seat. Many regulars shuffled in to join me, and one seemed a bit miffed after the rank had filled. My neighbor told me apologetically that I was sitting in his friend’s seat. Of course I moved. Local loyalists have privileges. On another occasion a BFI staff member said that she worried that one of her friends might become “one of those sad front-row people at the NFT.” They didn’t seem unusually unhappy to me, but then they wouldn’t, for I am one of them. My strangest contretemps with a front-row devotee came during a visit to the Munich archive. They were running Get Carter and I was the first entrant. I secured my front-row center post and settled down to read. (Front-row people show up early enough to finish substantial portions of Dostoevsky novels before the lights go down.) Suddenly an aged German lady, fortunately not Luise Ullrich, stood before me. I looked around and saw that we were the only people in the theatre. Nerdesse oblige. I relocated to the seat behind her. Moved by my gallantry, she twisted around to talk with me. I asked if she really came every night. Comments about disloyalty to old friends leaped to my tongue, but I kept quiet. Soon Get Carter started. The old bat immediately fell asleep. She slept through the whole movie. I wanted to knock her upside the head. When I left, she was still out, snoring in my seat. There are other drawbacks to the avant-garde spot in the movie theatre. Most people are bothered by handheld shots and 3D if they sit close, but I don’t find myself affected. Granted, I probably miss some of the surround-sound effects, which are apparently designed for a sweet spot far behind my territory. If it’s any compensation, the left/ right channels are really vivid for me. The biggest drawback, though, is that you don’t have eyes in the back of your head. During Q & A sessions, you can’t track the conversation without twisting around in your seat. So I sit there as if I were listening to the radio. Worse, sitting close can render you oblivious to things going on behind you. If a fistfight broke out in that heavily populated rear section, you’d be in a poor position to watch it. Occasionally being in the front row makes me miss an outburst that was probably pretty entertaining but leaves me feeling like the guy in Pompeii who wondered why everybody was running past him just before a couple of tons of ash buried him. No problem, I assured her; I’d seen that from the front row too. No one joined me in the front. But there was a sizeable audience. Once people had settled down, her introduction explained five things, each one adding to a litany of doom. (1) She played the protagonist. (2) The film was improvised. (3) It was shot handheld. (4) The actors were her friends. (5) It was a satire on the superficiality of Los Angeles life. She wished us a good screening and said she’d see us afterward for a discussion. The film was as dire as I’d feared. When the lights came up I noticed that nobody was setting up the microphone on stage. I turned around. The technicians were putting away the projection equipment. I was the only viewer who’d hung on to the end. Needless to say, there was no auteur and no Q & A. Despite all the drawbacks of front-zone sitting, I feel vindicated by a recent revelation. A review quotes James Wolcott’s acount of Pauline Kael’s preferred viewing station. A fourth possibility is that everybody likes to watch the audience come in, as people do at weddings. For some research on whether students sitting up front get higher grades, go here (abstracts only) and here. Jonathan Cohen provides a nice analysis of the research on perceptual constancy here. 3D has rekindled debates about where to sit; for one exchange among cinematographers, go here. Le Pied qui étreint is discussed in more detail here. 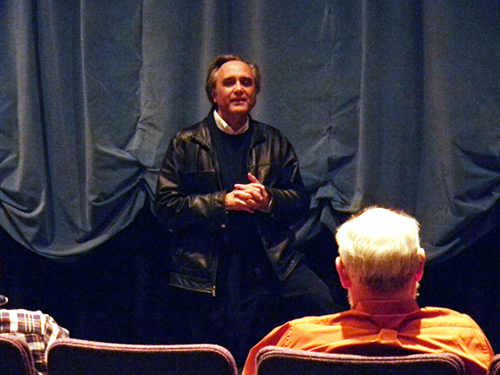 Joe Dante at University of Wisconsin–Madison, November 2011. Photo by Jeff Kuykendall. For more on Dante’s visit, go to this earlier entry and to Jeff’s coverage here. PS 23 January 2012: Please note that another couple likes to sit in the front row (from here). This entry was posted on Wednesday | November 16, 2011 at 8:44 am	and is filed under Festivals, Film archives, Movie theatres, Readers' Favorite Entries. Responses are currently closed, but you can trackback from your own site.